8 oz. Burger Bar recently expanded into the Seattle market. Food Network fans will recognize the name behind it – Chef Govind Armstrong. The website is very promising, talking about “humanely raised, hormone-free Black Angus sirloin” and “the finest local ingredients”. When @drewbenz and I sat down to see for ourselves (expect his review soon as well) the first thing we noticed about the menu was that the house blend in the standard patty is a mix of sirloin, tri-tip, short rib, and chuck. That certainly sounds good to me – and what’s this? Hempler’s bacon? Beecher’s Flagship cheese? Clearly they’re not only serious about their ingredients, but they’re making some of the same decisions that I would in their place. 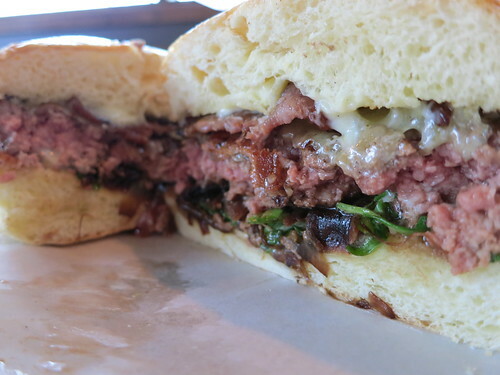 I ordered “The 8 oz.” – their italics, not mine – which is described as “house blend, wild baby arugula, balsamic onions, hemplers bacon, truffle aioli, beecher’s flagship”. I was happy to see that the menu recommended ordering your burger medium rare to medium. I asked for my usual medium rare, along with a side of roasted garlic fries. When the burger hit the table I was a happy man. Everything looked and smelled great. All the obvious visual cues I look for were there – juicy patty, melted cheese, and a toasted bun. My first couple of bites confirmed that impression – this was a really top-notch burger. I’d put this burger on my “Top 5 Burgers in Seattle” list. It’s not easy to find flaws with it, but it was a few ticks short of perfect. The patty was a little over-salted. The proportions of the burger felt slightly off. The items that accompanied the patty felt like they were right for a 6 oz burger, but they were a little lost against the 8 oz patty. They were all very good – even though I’m not a huge fan of arugula on burgers as a general rule – but just a little too muted. It doesn’t factor into the score, but I really like the roasted garlic fries. Great flavor, and the garlic was roasted enough that I didn’t go back to work with hideous garlic breath. 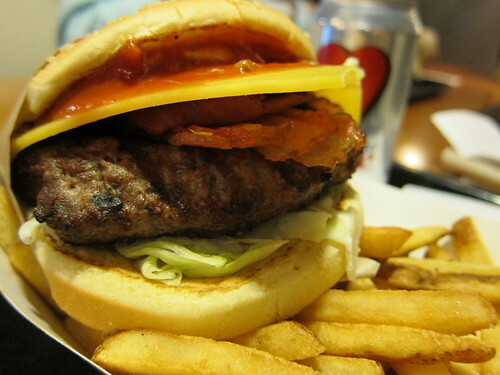 This was clearly a burger that was assembled from high-quality ingredients and cooked with care. Will I be back? Oh, hell yes. After a summer filled with travel and a variety of other commitments, we re-assembled Legit Beef – that’s myself (@thevowel), @drewbenz, & @KPaul – at Uneeda Burger last week. Since Uneeda opened we’ve been asked a number of times when we were going to be reviewing it. It turned out that last week was the perfect time to go. It was a gorgeous Seattle summer evening that was made for the patio at Uneeda, burgers, and a pitcher of good beer. The menu at Uneeda speaks to me. The Classic burger is simple as it should be, but if you want to dress it up you’ve got plenty of interesting options. While Drew & KP elected to go with various Signature burgers, I went straight for the Classic. If I stick to my standard bacon cheeseburger it’s much simpler for me to compare the burger to others that I had. I did make two deviations from my standard, though – a 2nd patty since I’d missed lunch, and going for the Gleason Ranch 28-day aged grass-fed beef. Following this was the only bad part of our visit to Uneeda. 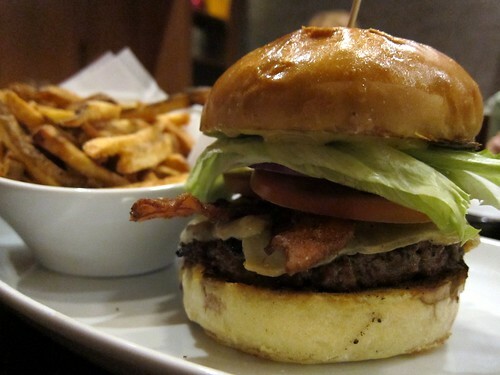 My burger arrived… WITHOUT BACON. Normally I’d ask someone for a couple of strips of bacon to add to the burger, but I was so hungry that I decided not to bother. I did miss the crunch that the bacon would’ve provided but I survived somehow. The bun was lightly toasted, but couldn’t hold up to the juices of two patties of very good beef. It wasn’t long before the bottom was soaked through. The Signature burgers came with a sturdier bun that probably would’ve served mine well. The cheese was nicely melted. The tomatoes were good, and while the lettuce was shredded it clearly wasn’t the straight-from-a-bag variety of crappy shreddy lettuce that some places serve. The special sauce was a little lacking in the special department. It was fine, but it didn’t have a ton of flavor and I would’ve been happier with less of it. I also prefer a smokier, less mayo-y sauce on my burgers. The beef was EXCELLENT. Clearly a huge step above the typical beef you’ll find between a bun, and it was cooked to Uneeda’s standard medium without being dry at all. The grind was coarse like it should be, and the patty was nicely assembled and not overly compressed. Next time I’m going to try the regular beef, though. The grass-fed patties had so much flavor to them that they stood out a little too much. A great burger is a harmony of all the ingredients, and isn’t just about the beef. The fries & onion rings were both above-average. The pitcher of Odin went down perfectly with the meal. The Pumphouse is a sports bar in downtown Bellevue. With 8 HDTVs and a stack of sports packages via DirecTV there’s almost always something good to watch if you’re a sports fan. Seattle’s Eastside isn’t exactly stacked with great sports bars – so is the Pumphouse a worthy hangout? If you’re reading this, I’m going to assume that you’ll agree with me that it depends on the burger. I ordered the Bacon Cheddar Burger – a 1/3lb patty “cooked medium and served on a sesame bun with our own special sauce, lettuce, tomatoes, dill pickle, and onions” minus the pickle. Although the house was packed – there were people standing in line waiting for tables or a seat at the bar – there wasn’t much of a wait for our food. When the burger landed in front of me I wasn’t sure what to think. Shredded lettuce isn’t normally a sign of a great burger. I took a bite and was pleasantly surprised. After a few more bites I realized that I was enjoying my burger far more than I’d expected to. 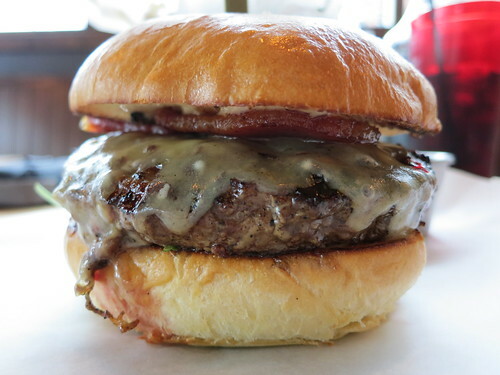 Looking at the burger I realized that while I’m not ready to crown them the “best burger in Bellevue” as the menu proclaims, they do take their craft seriously. The bun was toasted. The cheese was melted. The patty wasn’t overcooked like you’ll find in most bars. The bacon had a nice crunch to it. While the ingredients might not be stellar, the burger in front of me was made with care. As a result, they got everything they could out of the ingredients they use. The fries were good, and so were the chili-cheese fries and onion rings we wolfed down on arrival. It’s also the only place in Seattle I’ve found Ninkasi IPA from Eugene on tap, and that’s a beer that goes perfectly with a burger and a game on TV. I may not think of the Pumphouse when I want a burger – but when I want to go to a bar and watch a game with some friends I’m going to the Pumphouse and having a burger while I’m there. + Attention to details delivers a very satisfying burger. – Shredded lettuce, otherwise average ingredients. Thanks to some unusually cooperative schedules we were able to schedule a Legit Beef team lunch earlier this week. A few emails went back and forth arranging the details when Drew suggested BunsOnWheels. The Classy burger pulled me in, seduced by her pretense. She was beautiful with 1/3rd lb fresh, all natural grass fed beef, lettuce, tomato, pickles, red onion, buns sauce. I added a second patty and bacon for effect. Beef looked great. Veggies and bacon were quality. In a word, this burger screams fresh. But in a classy kind of way. If I’m going to find a rip to this burger, and it’s a stretch at best, it’s going to have to be the bun. Definitely a nice bun. Fresh and tasty. But as brioche goes, a little light and under matched when paired with a perennial burger and fixings. 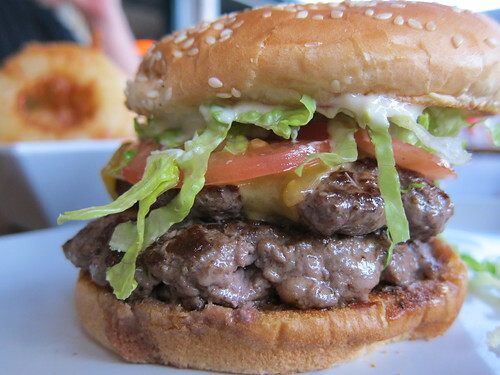 This is a burger that does absolutely nothing wrong. If I’m being feed from the side of a truck, this is the kind of class I want in my mouth. Buns on Wheels serves up a high quality burger that far exceeds expectations for any establishment, let alone one powered by Diesel. Perhaps ironically, my only complaint is with their bun which I found to be dry, truly a shame because it was the perfect size relative to the burger. Beef was top notch, coming close to the taste you can expect at a steakhouse, and the veggies were fresh and well-proportioned. Cheese, bacon and sauce were up to par but nothing to write home about. 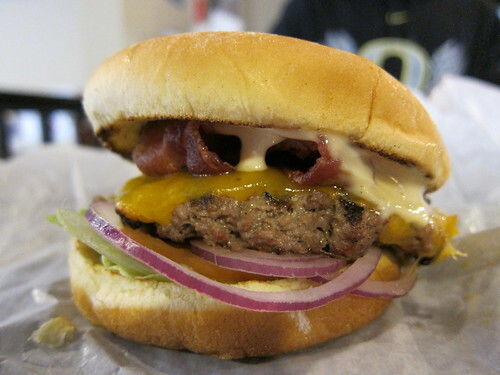 My burger (pictured) was a Cheesy ordered medium-rare with bacon but without pickles. Their menu describes the Cheesy as 1/3lb of beef with cheddar, lettuce, tomato, pickles, red onion, BUNS sauce, and truffle fries. All burgers come in a brown paper box. Upon opening the box I got both a great whiff of food that I wanted to eat, and food that looked good. My first bite was great, and the burger was exactly the medium-rare I’d asked for. The overall balance of the burger was pretty good – no one ingredient overwhelmed the others. The flavors of the bacon and cheddar were too subtle for my taste, but given the quality of the beef and the care with which it was cooked I’m ok with that. The bun was a too-soft brioche, but still above-average. Taken as a whole I was very satisfied and I’ll definitely be going back. The fries were pretty good, and without a doubt much better than average for frozen fries. The truffle flavor was nice and not at all overwhelming. It’s been almost a year since the last time I had a burger at John Howie Steak in Bellevue. I’ve been there several times since, but always for dinner and I usually get the (brilliant) 42-day-aged New York Strip. Yesterday I was in the neighborhood and decided it was time to check back on the burger. 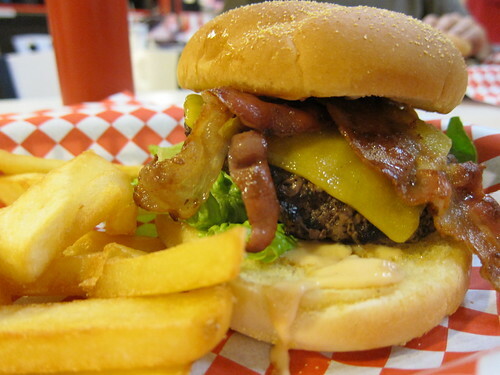 JHS actually offers three different burgers at lunch – the USDA Prime Beef Bacon Cheeseburger (pictured), the Kiss Your Hips Goodbye (3/4 lb of beef, onion rings, and bacon between two grilled cheese sandwiches), and a Peppercorn Crusted Wagyu Burger. 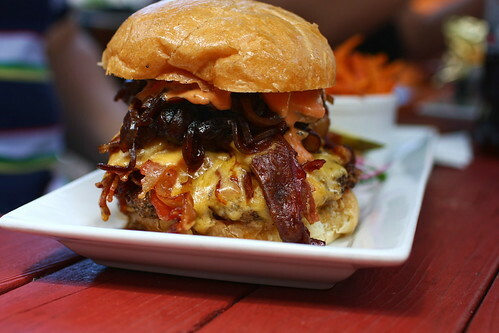 My tastes definitely run traditional when it comes to burgers so I once again went with the Bacon Cheeseburger. The menu describes it as follows – 1/2 pound ground prime chuck, Beecher’s Cheddar, Kurobota bacon, house baked bun, drive-in sauce, lettuce, tomato, pickle (not on mine! ), and sliced red onion. To put it simply, my burger was outstanding. Great beef cooked to exactly the medium-rare I’d asked for. Melted Beecher’s, outstanding bacon, and really nice fresh veggies. There was a little too much lettuce for my taste, but a lot less than my last burger here. I’ve really only got one complaint about this burger, and that’s the bun. 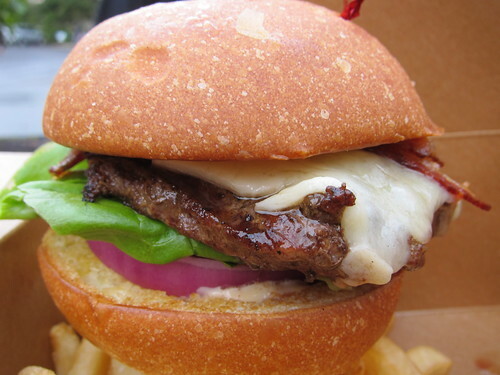 This is a really juicy burger, and the fact that I enjoy mine medium-rare only accentuates that. The bun tastes nice and was toasted, but it simply cannot come close to holding up under this patty once you bite in. The bottom half melted away and I had to finish the last few bites with a fork. That said, I finished every bite as I wasn’t letting any of this go to waste! The fries were excellent, and I really enjoy the John Howie Amber. 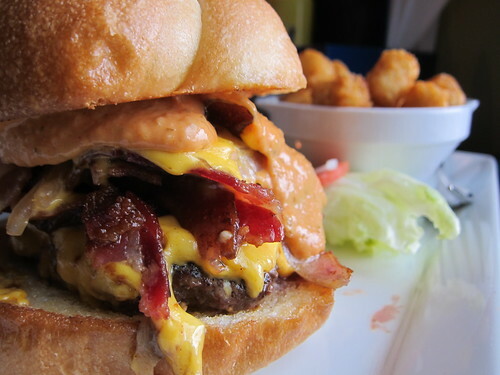 Not that the burger isn’t enough by itself, but you should also try the tempura bacon appetizer – it’s amazing. We returned to the Lunchbox Laboratory this weekend to take a second look at one of the few burgers to earn a 5 star rating from one of the crew at Legit Beef. Never having been, I decided to cast an objective eye on the experience. Wise men render sage words to first-time visitors of the Lunchbox Laboratory . The consensus among the burger illuminati is to choose one ingredient from each column of the menu: one meat, one cheese, one topping, one sauce. Nothing wrong with this philosophy, but no matter what you do, you’ll still have a burger you can’t fit your mouth around. Be conservative and exercise restraint but adding one or two extra toppings or cheeses is not, inherently, a bad thing. Experimentation is encouraged, it’s a god damned laboratory. For my burger, I went with 1/2 lb beef patty (obvi), cheddar, maple bacon, candied balsamic onions, and their secret burger sauce. This was freakin’ delectable. Let’s go from top, down. The bun is a Kaiser, toasted to perfection and doing an admirable job of holding together despite the abundance of juices from the beef and onions. The secret burger sauce is solid, pretty standard thousand-islands-esque burger sauce but there’s nothing wrong with that. The bacon is, in a word, perfection. The slice is not too thick and the bacon is cooked lightly, allowing you to actually taste the maple flavor. They get away with the light cooking because the cut is so lean that it may as well be a slice of ham on your sandwich. The candied balsamic onions were great, trending the burger toward the sweet side but the saltiness of the cheddar cheese helps to keep the burger balanced. There wasn’t a whole lot of input from the cheddar but I doubt if the strongest of cheeses would have overcome the other flavors of the burger to shine through. The beef is a quality patty but here I find my only fault with the experience. The seasoning they use in their beef is noticeably heavy on the pepper. The taste of the beef should never be masked by its seasoning, particularly such a quality and juicy blend as they serve. There’s plenty of flavor here, it’s just a shame that the beef was seasoned by a kid who works at Fat Burger before they put it on the grill. This burger was superb. 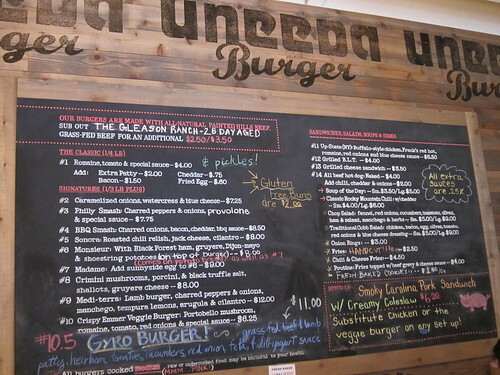 All of the ingredients are top notch, as evidenced by the $20+ tally for each burger. Well worth it. There’s a great experience to be had here, you just need to find casino games your own. You know what you like but you don’t know if it all works on a burger. That’s half the fun. 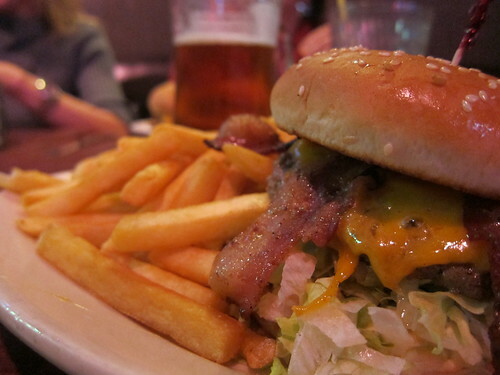 So long as you keep it reasonable you’re going to have one of the best burgers of your life. I took a shot and it paid off to the tune of a 4.0/5.0. You can easily build a burger here ranging from 3.0 – 5.0 depending on how you top replica rolex watches it. It’s not about building the perfect burger, but building a great, unique burger. This is the place to do that. You miss out if show up and order a plain cheeseburger. Unbeef: I had sweet potato fries, unremarkable, but the tots are great. You get to choose from 9 different salts too, pretty rad. The shakes look awesome. Lunchbox Laboratory 1/2 lb bacon cheeseburger with balsamic onions.